One of the inherent advantages of e-learning is interactivity -- but creating interactive content requires oodles of creativity -- it can also be plain challenging and difficult. And choosing an application to give shape to that creativity is a difficult choice to make. Raptivity, one of the well known e-learning creating applications provides a plethora of options and possibilities -- in this review, we'll explore Raptivity's interface and capabilities. Raptivity makes it easy to create e- learning content with a library of pre-built interactions that can be further customized. Raptivity outputs to Flash SWF movies -- something that's become a standard in the e-learning sphere these days. More importantly, Raptivity can create all this content without the need to do any coding or programming. Raptivity Essential includes the core Raptivity product with 35 interaction models. Raptivity Standard includes the Raptivity Essential product (see above) with Standard Pack 1, Standard Pack 2 and Standard Pack 3 which all contains even more pre-built interactions. In addition the Booster Pack 1 contains another 35 interaction models. So what is an interaction model? These are pre-built templates for types of interaction such as puzzle, slide show, survey, learning games, simulations, etc. My contact at Raptivity for this review was Isha Gupta - thank you, Isha. Download the installer, run the setup routine and follow the instructions. You'll end up with a Raptivity program group in your Windows Start menu (see Figure 1 below). When Raptivity is launched, you are presented with a dialog box (see Figure 2) that allows you to choose from New Interactivity and Recently Customized Interactivity. 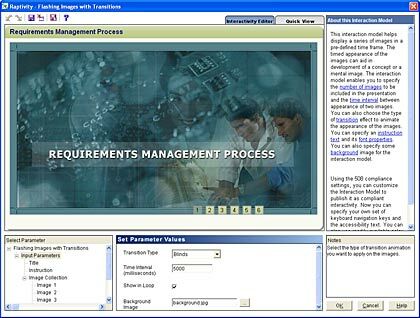 Select New Interactivity -- this opens the Raptivity Media Explorer dialog box (see Figure 3) with a collection of prebuilt interaction model -- I chose the Flashing Images with Transitions option. Based on the interaction model selected, a wizard will open as shown in Figure 4. Click Next to move to the subsequent screen that allows you to include information about the project -- such as title, number of images, transition types, playing time, etc. When done with the screens in the wizard, click the Finish button -- this opens another window (see Figure 5), where you can make some more changes in parameter values. After making the edits, save the project and click the File | Publish option. This opens the Interactivity Publisher dialog box (see Figure 6). Thos dialog box also allows SCORM/ AICC tracking for all interactions. Click the Publish option, and Raptivity exports your project to a Flash SWF movie. Soon thereafter, it allows you to preview the Flash output. I need to add here that the above workflow explained a very simplified sequence -- all through the process, you can customize the interaction model and the output to a very minute level. Apart from the wizard based interface, Raptivity includes a full featured Interactivity Editor (see Figure 7). The Flash movies created with Raptivity can be hosted online or inserted within PowerPoint slides. You can also use them with your LMS or integrate it within other Flash authoring environments. Raptivity Essential costs $750 while Raptivity Standard (includes Essential version, Standard Pack 1, 2 and 3) is priced at $1995. The Raptivity Booster Pack 1 costs $495. Support option includes e-mail, online training and phone support. For what it does, Raptivity provides a very viable platform for the creation of learning interactions for e-learning. The interaction model approach keeps the learning curve low -- beginners can use the wizard interfaces while more advanced users will love the customization options available.